This year Shakespeare turns 450, and people will be celebrating all around the globe from Shakespeare’s hometown of Stratford upon Avon (where the tradition of celebrating his birthday goes back over 200 years) to Paris to right here in Falvey Memorial Library. This year Falvey is providing several opportunities for those interested to celebrate Shakespeare’s birthday. First, visit the Shakespeare display up on Falvey’s 4th floor, near the Shakespeare collection, and view items on display from Falvey’s Special Collections. 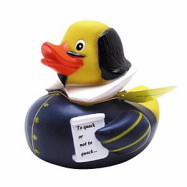 Second, participate in our Shakespeare scavenger hunt for a chance to win a Shakespeare duck. Rules of participation and clues for the scavenger hunt can be found at the 4th floor display. Last, but certainly not least, join us in the Falvey Hall Reading Room on April 23 at 6 p.m. to celebrate with the Villanova Department of English, ACS, and the Library. There will be games, prizes, skits performed by students, and birthday cake! Although the exact date of Shakespeare’s birth is unknown, the baptismal register from Holy Trinity Church in Stratford upon Avon shows that he was baptized on April 26, 1564, and his birthday is traditionally celebrated on April 23 (St. George’s Day). For detailed information about Shakespeare’s baptismal record, see this video from The Shakespeare Birthplace Trust. Holy Trinity’s records also mark Shakespeare’s burial, on April 25, 1616. If you’re interested in learning more about Shakespeare, his early life and his family, the Shakespeare Birthplace Trust has a wonderful collection of videos and many other resources that may be of interest to you. Shakespeare wrote 38 plays (some in collaboration with other playwrights), 154 sonnets and two narrative poems. Love them or hate them, Shakespeare’s stories have endured the test of time and continue to inspire people. Of course, many direct adaptations of Shakespeare exist in popular culture, such as Franco Zeffirelli’s 1968 “Romeo and Juliet,” Kenneth Branagh’s “Hamlet” or “Henry V,” and countless others. In addition to adaptations that use Shakespeare’s original language, a multitude of films borrow Shakespeare’s stories and superimpose modern language, different cultures, and different time periods. Such films include “West Side Story,” 1961 (“Romeo and Juliet”); Akira Kurosawa’s “Ran,” 1985 (“King Lear”); “Ten Things I Hate About You,” 1999 (“Taming of The Shrew”); “She’s The Man,” 2006 (“Twelfth Night”); “Forbidden Planet,” 1956 (“The Tempest”); “O,” 2001 (“Othello”); “Get Over It,” 2001 (“A Midsummer Night’s Dream”); “Scotland PA,” 2001 (“Macbeth”); and many more. You can browse a full list of Shakespeare films held at Falvey Memorial Library right here. Shakespeare was inspiring artists long before film was even invented. When you visit the Shakespeare display currently on Falvey Memorial Library’s fourth floor, you will notice one or more of the twelve large sized prints which have been placed around the Shakespeare section. These prints are from volume 1 of The American edition of Boydell’s illustrations of the dramatic works of Shakespeare, by the most eminent artists of Great Britain. Published in 1791 and again in 1805, this collection of prints is bound in a large-format book known as an elephant folio due to its large size (22 by 28 inches). Original prints from the first editions of the book now go for $300-$950 each and are beautifully detailed depictions of scenes from Shakespeare’s plays. The prints hanging in the Library are copies, but the actual book the images were scanned from is held in Falvey’s Special Collections, and anyone is welcome to make an appointment to see it.